Nevada struck it rich Thursday as shiny new quarters began rolling off the production line at the U.S. Mint in Denver. “After all the work we’ve done to get ready for our quarter, it was exciting to see it being produced,” State Treasurer Brian Krolicki said in a telephone interview. Krolicki led a 25-person Nevada delegation to Denver for the “ceremonial strike” of the Silver State’s quarter, which features three wild horses. The Nevada visitors, including representatives from Krolicki’s office and from Nevada State Bank, were each able to press some quarters and take a look at the coins before returning them to Mint officials. The coin is scheduled to go into circulation Jan. 31 in a Carson City ceremony planned at the Capitol. Among those in Thursday’s group in Denver was Krolicki’s “special adviser,” his 7-year-old daughter Kate, a second-grader at Zephyr Cove Elementary School who suggested a wild horses design. In a month-long voting among the public for five finalist designs, almost 60,000 ballots were cast. State officials said the votes of schoolchildren were pivotal in the selection of horses. The other finalists were images of a desert bighorn sheep, an old-time miner, ancient Indian artifacts and two pickaxes with sagebrush and rising sun. The coin is part of the U.S. Mint’s 50 State Quarters Program. The quarters were introduced in 1999 and minting is done in the order of each state’s entry into the union. Under the 10-year introduction program, coins of five states are added each year. Nevada became the nation’s 36th state in 1864. 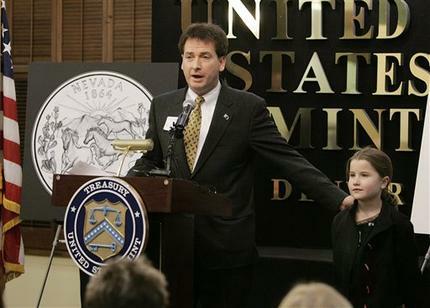 Krolicki, who was appointed four years ago to direct the design and selection process of the Nevada coin, said Mint officials told him there will be a 10-week production run for the quarter. The number of coins to be produced hasn’t been determined. For the five state quarters minted in 2005, the average production was 602 million.